In her brilliant new opening essay, Banerjee says of Berdyaev "he was never more than a curious but unwelcome guest in history. He fearlessly engaged it on the level of ideas while remaining alien to its means and ends, gifted with an incurable longing for transcendence." 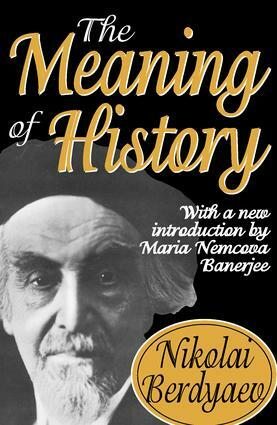 Witness to two world wars, Berdyaev observed the destruction of established cultures in the traumatic birth of new systems. Arrested on political suspicion-by Czarist and then by Bolshevik police—he died in exile in France in 1948, carrying forth his intellectual work until the end. Berdyaev considered the philosophy of history as a field that laid the foundations of the Russian national consciousness. Its disputes were centered on distinctions between Slavophiles and Westerners, East and West. The Meaning of History was an early effort, following World War I, that attempted to revive this perspective. With the removal of Communism as a ruling system in Russia, that nation returned to an elaboration of a religious philosophy of history as the specific mission of Russian thought. This volume thus has contemporary significance. Its sense of the apocalypse, which distinguishes Russian from Western thought, gives the book its specifically religious character. In order to grasp and oppose the complex phenomenon of social and cultural disintegration, Berdyaev shows that human beings must rely upon some internal dialectic. After the debacle of the war, the moment arrived to integrate Russian historical experiences into those of a Europe, which, although torn by schism, still claimed to be the descendant of Christendom. The book is remarkable for its powerful stylistic grace, and astonishingly contemporary feeling.